DELAFIELD, Wis. (Stockpickr) -- There isn't a day that goes by on Wall Street when certain stocks trading for $10 a share don't experience massive spikes higher. Traders savvy enough to follow the low-priced names and trade them with discipline and sod risk management are banking ridiculous coin on a regular basis. Just take a look at some of the monster movers to the upside in the under-$10 complex from Wednesday, including BG Medicine (BGMD, which exploded sharply higher by 59%; Miller Energy Resources (MILL, which surged higher by 44.2%; OHR Pharmaceutical (OHRP, which soared higher by 26.6%; and Seanergy Maritime (SHIP, which spiked to the upside by 23%. You don't even have to catch the entire move in lower-priced stocks such as these to make outsized returns when trading. One under-$10 clinical stage biopharmaceutical player that's starting to trend within range of triggering a major breakout trade is Pieris Pharmaceuticals (PIRS - Get Report), which focuses on the discovery and development of Anticalin class biotherapeutics. This stock has been smacked hard by the sellers over the last three months, with shares down sharply by 32%. If you take a glance at the chart for Pieris Pharmaceuticals you'll see that this stock recently gapped down sharply from around $4.40 a share to under $2.80 a share with heavy downside volume flows. Following that move, shares of Pieris Pharmaceuticals have started to stabilize a bit, with the stock trending sideways over the last few weeks between $2.40 on the downside and just over $2.80 a share on the upside. This move has formed a tight consolidation chart pattern, and now this stock looks ready to break topside and potentially trigger a major breakout trade. 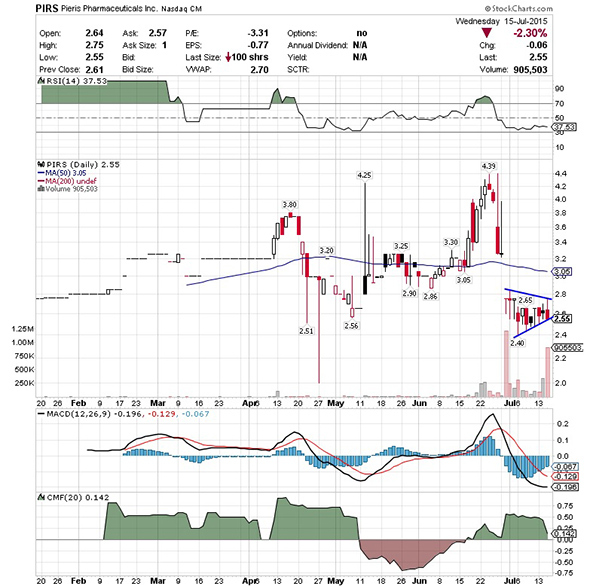 Market players should now look for long-biased trades in shares of Pieris Pharmaceuticals if it manages to break out above the upperend of its recent sideways trading chart pattern that will trigger over $2.80 to around $2.85 to $2.90 a share with high volume. Look for a sustained move or close above those levels with volume that hits near or above its three-month average action of 61,073 shares. If that breakout triggers soon, then this stock will set up to re-fill its previous gap-down-day zone from June that started at $4 a share, or even possible make a run towards its all-time high of $4.40 a share. Traders can look to buy this stock off weakness to anticipate that breakout and simply use a stop that sits right around some key near-term support levels at $2.45 to $2.40 a share. One can also buy shares of Pieris Pharmaceuticals off strength once it starts to smash above those breakout levels with volume and then simply use a stop that sits a comfortable percentage from your entry point. Another under-$10 health care player that's starting to move within range of triggering a big breakout trade is BioLife Solutions (BLFS - Get Report), which develops, manufactures and markets patented hypothermic storage and cryopreservation solutions for cells and tissues in the U.S. This stock has been on the upswing over the last six months, with shares moving notably higher by 10.4%. If you take a look at the chart for BioLife Solutions, you'll notice that this stock has been consistently making higher lows since its April low of $1.50 a share. That pattern of higher lows has now formed a major uptrend line for shares of BioLife Solutions that 's now acting as a big support level for the stock each time it has sold off. This demonstrates that buyers are paying up to own shares of BioLife Solutions whenever it pulls back, and this could be a strong indication that the stock is in heavy demand among institutional players. 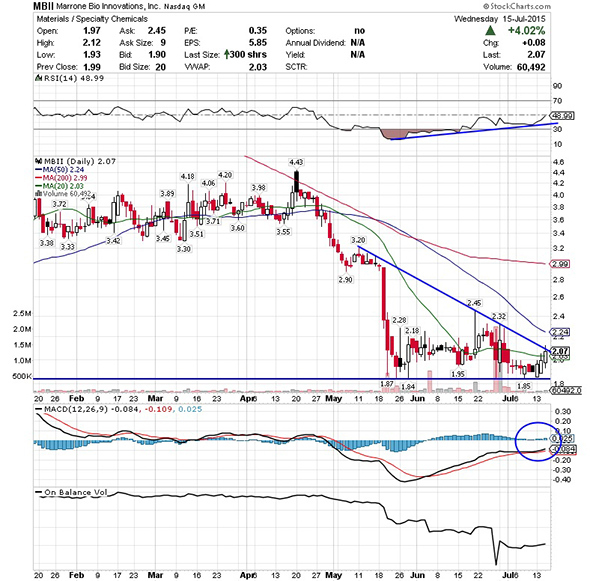 This stock is now starting to spike to the upside right above a number of key moving averages, and that spike is quickly pushing this stock within range of triggering a big breakout trade above a key downtrend line. 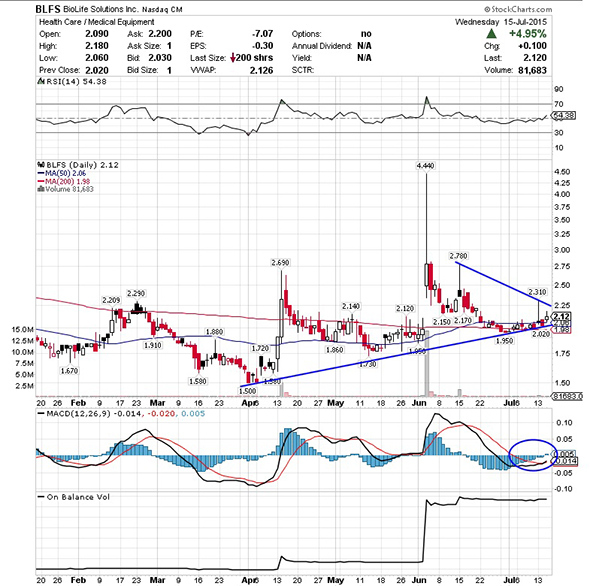 Market players should now look for long-biased trades in BioLife Solutions if it manages to break out above a key downtrend line that will trigger over $2.31 and then above $2.50 a share with high volume. Look for a sustained move or close above those levels with volume that registers near or above its three-month average action of 356,687 shares. If that breakout gets set off soon, then this stock will set up to re-test or possibly take out its next major overhead resistance levels at $2.78 to possible even its June one-day spike to $4.44 a share. Traders can look to buy this stock off weakness to anticipate that breakout and simply use a stop that sits right around some key near-term support levels at $2.02 to $1.95 a share. One can also buy shares of BioLife Solutions off strength once it starts to trend above those breakout levels with volume and then simply use a stop that sits a comfortable percentage from your entry point. An under-$10 agricultural chemicals player that's starting to spike within range of triggering a major breakout trade is Marrone Bio Innovations (MBII - Get Report), which provides bio-based pest management and plant health products for the crop protection, water treatment and other target markets in the U.S. and internationally. This stock has been slammed lower over the last six months, with shares plunging to the downside by 43.2%. If you take a glance at the chart for Marrone Bio Innovations, you'll notice that this stock recently plunged lower off its April high of $4.43 to its new 52-week low of $1.84 a share hit in June. During that downtrend, shares of Marrone Bio Innovations have been consistently making lower highs and lower lows, which is bearish technical price action. That said, this stock has now started to stabilize and consolidate over the last two months, with shares moving sideways between $1.84 on the downside and $2.45 on the upside. Shares of Marrone Bio Innovations spiked sharply higher on Wednesday back above its 20-day moving average of $2.03 a share. That spike is now quickly pushing this stock within range of triggering a major breakout trade above the upper-end of its recent sideways trending chart pattern. Traders should now look for long-biased trades in Marrone Bio Innovations if it manages to break out above its 50-day moving average of $2.24 a share and then above more key resistance levels at $2.32 to $2.45 a share with high volume. Look for a sustained move or close above those levels with volume that hits near or above its three-month average action of 144,741 shares. If that breakout develops soon, then this stock will set up to re-test or possibly take out its next major overhead resistance levels $3 to $3.20 a share. Traders can look to buy this stock off weakness to anticipate that breakout and simply use a stop that sits right around some key near-term support at $2 a share or near its recent 52-week low of $1.84 a share. One can also buy shares of Marrone Bio Innovations off strength once it starts to clear those breakout levels with volume and then simply use a stop that sits a comfortable percentage from your entry point. An under-$10 education and training services player that's starting to spike within range of triggering a near-term breakout trade is ITT Educational Services (ESI, which provides postsecondary degree programs in the U.S. This stock has been smoked to the downside by the sellers over the last six months, with shares plunging sharply lower by 48.1%. If you look at the chart for ITT Educational Services, you'll see that this stock spiked sharply higher on Wednesday right off its 50-day moving average of $3.83 a share with decent upside volume flows. That spike pushed shares of ITT Educational Services right into its 20-day moving average of $4.27 a share. That move also pushed this stock right up against a key downtrend line that dates back to mid-June. Shares of ITT Educational Services now look poised to potentially trigger a major breakout trade above that key downtrend line it tagged on Wednesday. Market players should now look for long-biased trades in ITT Educational Services if it manages to break out above that downtrend line which will trigger over $4.50 to $4.78 a share with high volume. Look for a sustained move or close above those levels with volume that hits near or above its three-month average action of 1.53 million shares. If that breakout materializes soon, then this stock will set up to re-test or possibly take out its next major overhead resistance levels at $5.15 to possible even its one-day spike high in June of $6.62 a share. Traders can look to buy ITT Educational Services off weakness to anticipate that breakout and simply use a stop that sits right below its 50-day moving average of $3.83 a share. One can also buy this stock off strength once it starts to take out those breakout levels with volume and then simply use a stop that sits a comfortable percentage from your entry point. 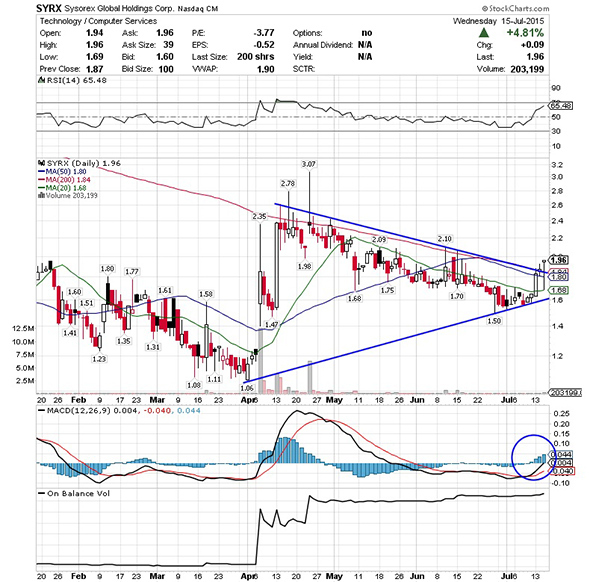 An under-$10 technology player that's starting to move within range of triggering a big breakout trade is Sysorex Global (SYRX, which provides data analytics and location based solutions and services to commercial and government customers worldwide. This stock has under pressure from the sellers over the last three months, with shares sliding sharply lower by 14.4%. If you take a glance at the chart for Sysorex Global, you'll notice that this stock spiked sharply higher on Wednesday right off its 20-day moving average of $1.68 a share and back above both its 50-day and 200-day moving averages of decent upside volume flows. That trend to the upside also came right above a key uptrend line that started back in April at $1.03 a share. This move to the upside on Wednesday also pushed shares of Sysorex Global above a key downtrend line that dates back to the start of April. This is potentially a significant breakout for this stock, and now shares of Sysorex Global look ready to clear some more major overhead resistance levels that could signal a large move to the upside is underway. Traders should now look for long-biased trades in Sysorex Global if it manages to break out above some key near-term overhead resistance levels at $2.10 to $2.20 a share and then above just over $2.40 a share with high volume. Look for a sustained move or close above those levels with volume that hits near or above its three-month average action of 270,302 shares. 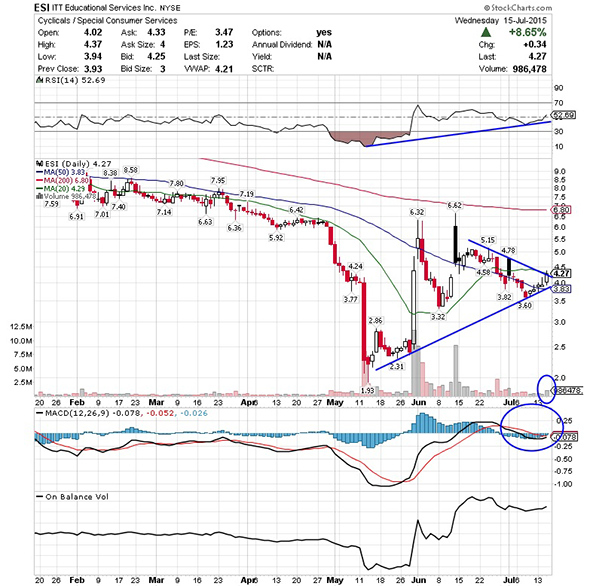 If that breakout hits soon, then this stock will set up to re-test or possibly take out its next major overhead resistance levels $3.07 to $3.50 a share. Traders can look to buy Sysorex Global off weakness to anticipate that breakout and simply use a stop that sits right below that major uptrend line at around $1.60 a share. One can also buy this stock off strength once it starts to bust above those breakout levels with volume and then simply use a stop that sits a comfortable percentage from your entry point. This article is commentary by an independent contributor. At the time of publication, the author was long PIRS.